A new 3D-printing system is forecast to change the industry forever. The revolutionary liquid method has been found to be 25 to 100 times faster than its rivals - and it looks like something straight out of Terminator 2. Carbon 3D, the relatively unknown California-based start-up behind the marvel, has pioneered the technique, which it calls Continuous Liquid Interface Production (CLIP). It uses lasers and oxygen in a way that slows down and allows the formed photosensitive resin to cure. This allows the printing to occur in three dimensions at once. According to 3D Print news site, the privately-owned company has been quietly developing the technology since its inception in 2013. The process goes like this: an oxygen window is created, allowing the machine to control precisely the mixing of the laser light and oxygen on the resulting resin. Variation in the mixture is what makes the shapes. The window is key here: it’s transparent to light, but allows oxygen to pass through it, the way a contact lens does, according to the company. Up to now, 3D printing has involved many mechanical steps repeated over a period of time. CLIP runs much quicker, produces smooth parts and allows for a range of materials. 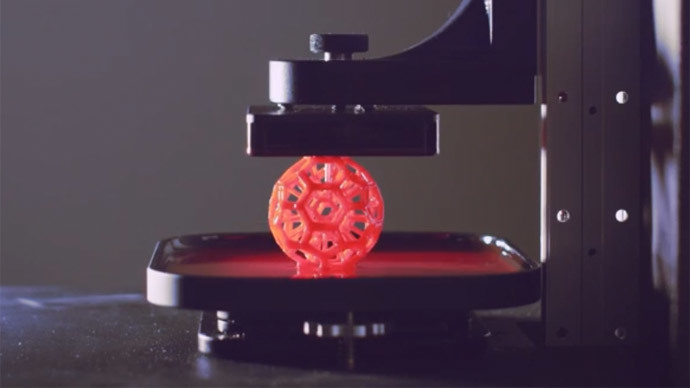 The company explains that traditional methods of 3D printing come up with a rather coarse material that it “notoriously” inconsistent, and whose properties are uneven because the technology prints in layers. The range of materials is likewise much larger than with conventional techniques. That means the range of products emerging as a result could also be much wider – from sports shoes to automotive parts, according to the maker. So how does a company so successful emerge from relative obscurity? Carbon 3D partnered up with Sequoia Capital – a giant in venture capital – and Silver Lake Kraftwerk. Between 2013 and 2014 they managed to raise $41 million. “If 3D printing hopes to break out of the prototyping niche it has been trapped in for decades, we need to find a disruptive technology that attacks the problem from a fresh perspective and addresses 3D printing’s fundamental weaknesses,” Jim Goetz, board member at Carbon 3D and partner with Sequoia says, according to 3D Print. The opinion is that this is what is needed for 3D printing to become really attractive.